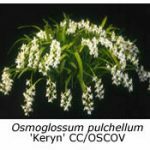 New growers occasionally ask me for a list of orchids that can be grown in Melbourne as companion plants to cymbidiums. 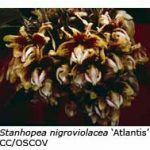 A complete list of such species and hybrids is beyond the scope of this publication, so I’ll confine my suggestions to those orchids that I personally grow outdoors. 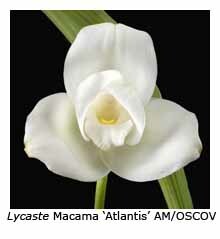 Cymbidiums, zygopetalums, Australian native dendrobiums and sarcochilus are so well known that I’ll ignore them here. Soft-cane dendrobiums also grow without heat but they must have good light all day long, particularly in winter, to flower well. Everyone should grow a few stanhopeas, if only for the enjoyment of watching their buds and curious flowers develop. 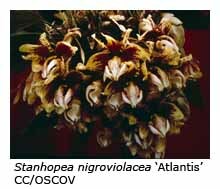 Stanhopeas must be grown in hanging baskets, as their flower spikes grow downwards through the compost. Some species require winter warmth but S. nigroviolacea, S. tigrina and S. wardii may be grown outdoors all year round in a cosy shade house. The first two usually flower in January but S. wardii flowers later, usually in early autumn. Many coelogynes (but not all) can be grown without heat. The most well known is Coelogyne cristata but C. flaccida, C. nitida and C. mooreana are also suitable. Coelogynes in general don’t like disturbance, so just ‘pot on’ as they grow and don’t divide them until they’re too big to fit through your car door! Stenoglottis longifolia is an African terrestrial orchid with long upright spikes of small pink flowers that open sequentially during May. The spike can carry up to 20 flowers open at the same time and bear a total of 50 or more overall. It multiplies readily, and you will often find divisions on the sales bench. S. woodii (white flowers in January or February) and S. ftmbriata (pink flowers in April) are less common but also grow without heat. The bright orange flowers of Ada aurantiaca often catch the eye at our spring shows. These tubular flowers don’t open widely but this fault is amply compensated for by the brilliance of their colour. In nature humming birds pollinate the flowers in their search for nectar. No collection would be complete without a few of the Mexican laelias. 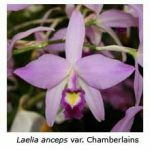 Laelia anceps is the most widely grown, its varieties Chamberlain’s (large pink/mauve flowers) and Veitchiana (white with a purplish lip) being very desirable. 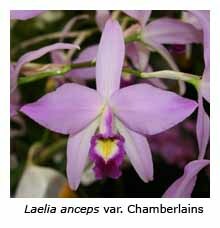 Laelia gouldiana, L. autumnalis and L. albida are others that will grow without winter warmth. A Brazilian species long known as Laelia pumila (its name has recently been changed to Sophronitis pumila) also grows under the same conditions. It bears relatively large pink or mauve flowers. Most maxillarias require warmth in winter but Maxillaria porphyrostele does well outdoors in Melbourne, and soon develops into a large specimen plant if progressively ‘potted-on’. Its yellow flowers emerge on short stems from below the leaves and are best seen if the pot or basket is suspended from the shade-house roof. M. picta (yellow flowers) and M. cucullata (orange) grow under similar conditions. 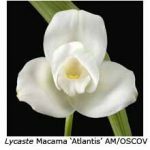 Many lycastes may be grown outdoors, although not if you live in an area that experiences hard frosts. Lycaste aromatica, L. cochleata and L. cruenta all do reasonably well in my shade house, although they would probably do better in the glasshouse. Most of the exhibition type lycaste hybrids, such as L. Macama, grow well without heat – they need good light to flower well. Osmoglossum pulchellum is a favourite with most orchid growers. 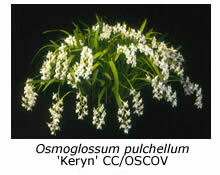 Its crystalline white flowers are long lasting, and a special favourite with floral artists for wired work. Other cool-growing species include Pleione formosana, Epidendrum ibaguense, Bletilla striata, Arpophyllum spicatum and the delightful miniature Encyclia polybulbon (syn. Dinema polybulbon), which grows into a specimen covered with small yellow flowers with white lips.